Gilberte Interiors, Inc. A Beach House - Gilberte Interiors, Inc. Working with a client for a number of years and developing a personal style together is what makes a project even more rewarding. When I received a call from this friend (after 20 years of working together, it’s tough to call her a “client”), I was excited to have the opportunity to work with her again and to help her plant new roots in a place that was so important to her. This property, located in the ocean village where she had spent her childhood summers and later summers with her children, would begin a new chapter for this couple. This small bungalow, which features a view to the water and the rocky New England coastline, had potential—as a realtor might tell you—but needed quite a bit of TLC and a healthy dose of creativity. The rehab plan for the house involved it being stripped, reorganized, and then augmented with a second floor on the existing footprint. Looking over the initial plans, we worked together to make sure that the house had the spaces it needed, without getting too cluttered. 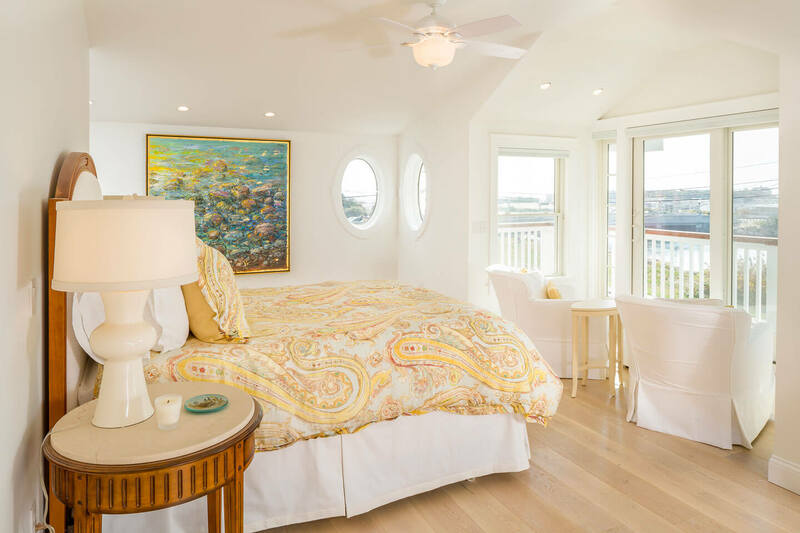 Kitchen layouts were adjusted, bedroom walls moved, and soon the plans reflected a relaxing flow that enhanced the sense of peace that the ocean can bring. I felt strongly that the master bedroom should be reconfigured to allow this couple to enjoy the volume of the space and the view to the water while keeping the focus away from the doorways. Today, the feeling of the house is welcoming and elegant in its simplicity, with whitewashed, wide-plank wooden floors and textiles that use natural fibers. Small touches make a big difference, such as glass knobs on the doors and cabinets, which add light and a sun-on-the-water-esque shimmer to the interior. The kitchen and stairway lighting feature LED pendants hand-crafted in Vermont while built-in seating with cushions and pillows encourages sitting down for impromptu chats. And throughout the home, each space highlights this family’s passion for collecting original art.